So what do a bunch of cruisers and fishermen do when the winds are howling, the boats are rocking and the there is no sign of the sun? You play with the sharks at the dock of course! A few of the fisherman that are staying at The Berry Island Club with us were cleaning some of their day’s catch and started throwing a few scraps overboard. It didn’t take long for the sharks to show up. One of the men strung some of the fish scraps on a rope and dangled them in the water. That is when the fun really started happening! Within a few minutes we had at least ten sharks swarming the docks. I’m not talking little tiny baby sharks either. These suckers were ranged from 5 – 10 feet! We saw nurse sharks, blacktips and a reef shark. It was incredible, but also a little scary considering this was maybe 10 feet from our boat. 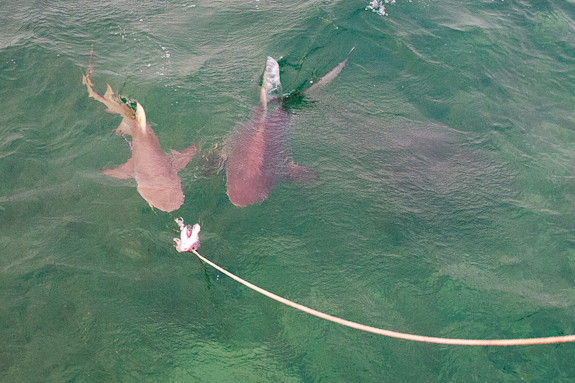 I was shocked at how gently the sharks approached the bait, first swimming by it and getting a feel for the situation. Then, they’d swim back around and attack. It was definitely one of the coolest things we’ve seen while in the Bahamas!